This has been quite a week. I’m feeling a little worn thin, so no fru fru comments on this post! Just the facts! I saw something on TPT last week that caught my interest. Brenda has a whole line of ‘uncover games’. I thought they were awesome, but they didn’t meet any of my speech or language goals. So I decided to test them out by making some of my own. Here’s my first attempt. If you like it, let me know what other skills you would like to see! Peeking Pictures: Pronoun Edition: Start by printing out a picture. Do not cut it apart. 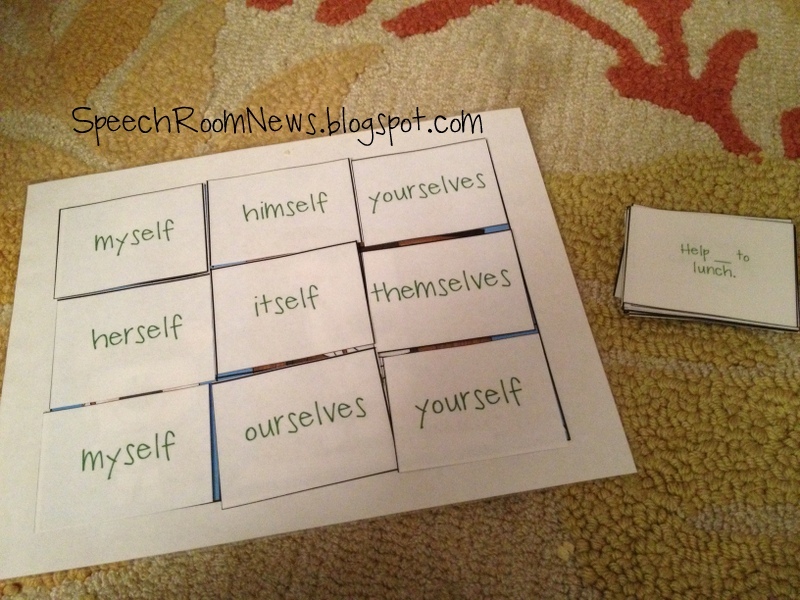 Give each student a set of these color coded pronouns visuals. 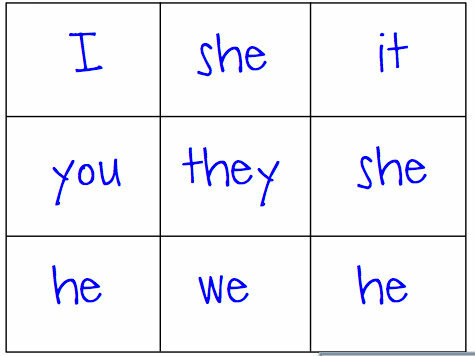 Choose one type of pronoun or a mixture of all sets. 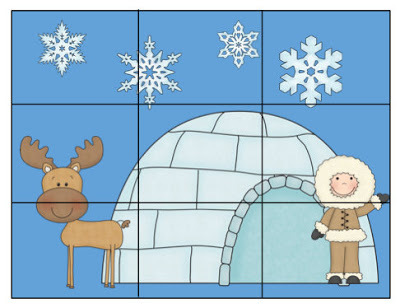 Cover the picture with 9 rectangles (pronouns). On each student’s turn. 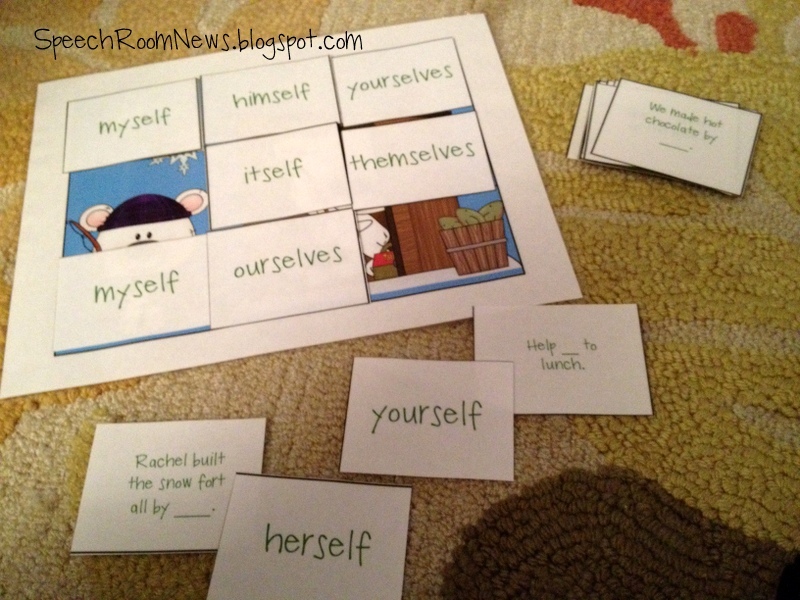 Pull sentence cards. Determine which pronoun will fill in the blank. Remove that pronoun from the picture scene. The first student to reveal his/her entire picture is the winner. The game employs some reasoning and planning. Some cards have multiple answers. Students may have to plan and think about the type of pronoun they use as an answer. 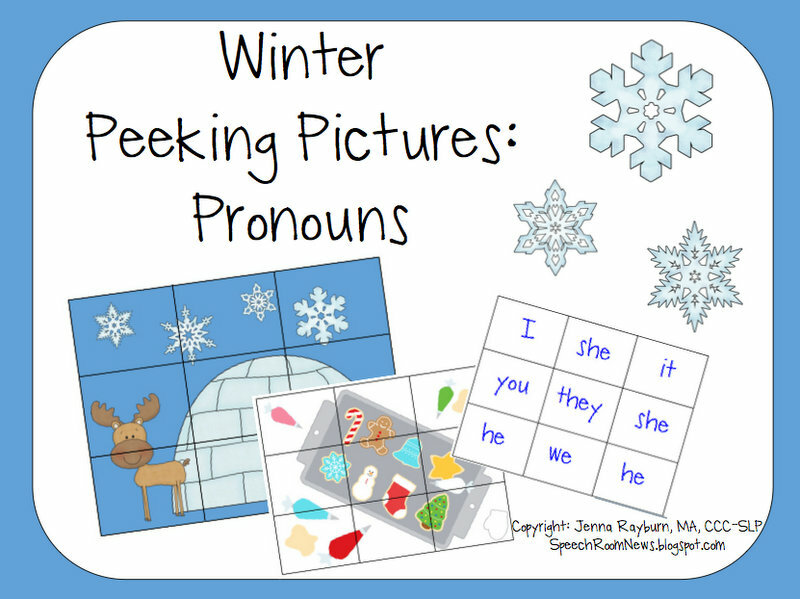 The document is 22 pages, includes 6 different winter scenes, 18 sentences per pronoun type (reflexive, subjective, objective, possessive) and 9 pronoun cards per set. The set is for your readers, and I used it on my 2nd and 3rd graders this week. It’s available in my TPT store. Leave a comment with which other skills you’d like to see! This is awesome, Jenna!! I love this idea. It is perfect for one of my clients right now! I think it’d be cool to do this with verb tenses or with negatives. Thanks! Cute idea! I agree about verb tenses. Wow what a nice idea! I think that it would work really well with an asking questions activity. 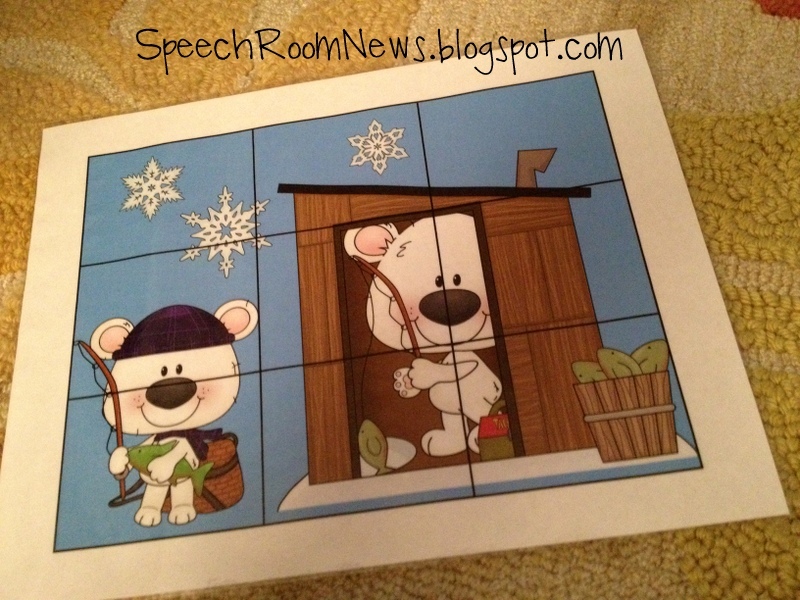 You could have the wh- words cover the picture and fill in the blank sentence cards. What a great idea! I am always impressed with your creativity and ability to create. An area I would like more info on is fluency with little ones. I mean really little ones – preschool age. Any thoughts? What a neat idea! Maybe something with opposites, attributes, colors and shapes for my little ones, actually anything your little heart desires would be great! This sparked up a question! Do you know of any standardized or non-standardized tests that evaluate pronoun use? I have 2 5-year-olds that do not use pronouns correctly that I would like to get more formal evaluation on to possibly move them from RTI to IEP. In my research of little tike tests, they only ask you if they do or do not use them. Any thoughts? Thanks! 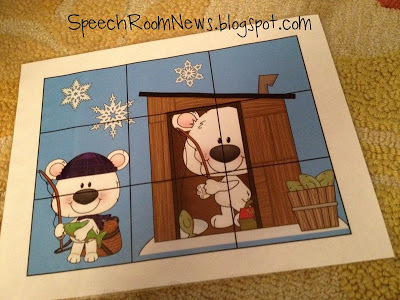 For a 5 year old the CELF P2 subtest for grammar addresses pronouns.